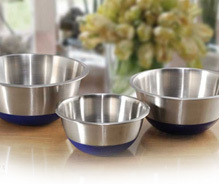 These exclusively designed non slip bowls are available in mesmerizing multi colored finishes to add a touch of class and refined taste to your dining spaces. The flawless stainless steel finish and polished shine also provides for optimum utility as an essential kitchenware item. 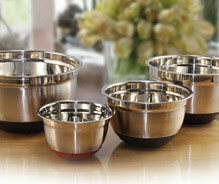 We can offer these in different finishes to meet the serving needs of varied dishes. Available Range : Extra Deep Mixing Color Bowl W/Silicone Base, Deep Mixing Bowl W/Silicone Base and Extra Deep Mixing Bowl W/Silicone Base. 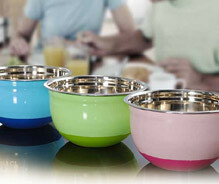 Perfect for the dinner table or for use outside, these coloured bowls are an essential kitchenware and is available in a variety of colours. This beautiful stainless steel deep mixing bowl is available with silicon base and is ideal for serving soup, popcorn, pudding etc. This unique piece is useful for deep mixing and is food safe. Available in bright stainless, this extra deep mixing bowl makes the preparation for cooking of your favorite dish - blending salad & dressing or for combining nuts and chocolate chips into a cookie dough batter.